A Bucks County bookstore is looking to sell its ‘wall of fame’ to keep the lights on. Think J.K. Rowling. Ellen Mager looks at her "wall of fame" inside Booktenders Secret Garden, the oldest children's book store in the Philadelphia region, in Doylestown. Mager is selling the wall that includes the signatures of J.K. Rowling, Marc Brown and many other award-winning authors and publishers in order to keep her financially struggling store afloat. Ellen Mager has surrounded herself with words inside Booktenders Secret Garden, her children’s bookstore in Doylestown. And perhaps some of the most important ones line the walls of her 37-year-old business. 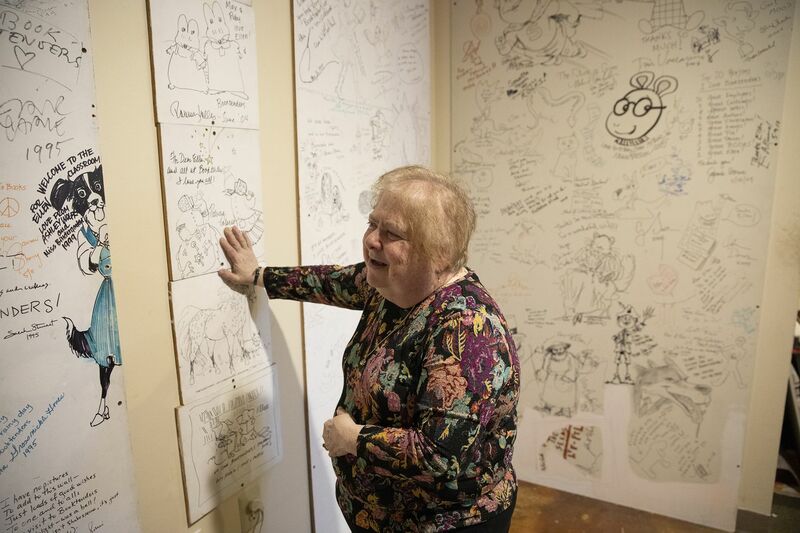 More than 200 top talents in the world of children’s literature have visited her store over the decades, wallpapering it with their signatures and sentiments. Eric Carle’s words rub elbows with an original sketch of Arthur, the bespectacled aardvark, by Marc Brown. The particleboard panels are a veritable hall of fame of Caldecott and Newbery Medal winners, but the crown jewel is a message of thanks from J.K. Rowling, who stepped into Mager’s store in 1999 during a media tour at the peak of Harry Potter mania. Rowling sketched a Sorting Hat and wrote that Mager, now 66, would fit right in with Gryffindor. The British author’s visit was a watershed moment for Booktenders, a memory Mager treasures. In recent months, she finds herself more frequently returning to the past as a distraction. Booktenders is in dire financial straits, its future uncertain in the world of Amazon and next-day delivery. In better economic times, a publishing company representative once jokingly told Mager the star-studded wall was her “retirement fund." Now, that may become a reality. J.K. Rowling's signature, scrawled onto the wall of Booktenders Secret Garden in 1999, stands alongside hundreds of other famous children's authors. Assessing the value of the wall has been difficult. Given that some of the signers have died and others, such as Rowling, are household names, Mager has received a rough estimate of $75,000 for the entire wall. But to her, it’s a priceless road map of the store she opened, on a lark, in 1983 while working as a youth hearing therapist at the Montgomery County Intermediate Unit. It’s survived two relocations and three iterations of Booktenders, now housed in a storefront on State Street. Mager’s customers treasure her approach to selling, an intimate process that’s tailored to tastes and interests. She joked that if a parent gave her 30 minutes, they’d walk out of her store with at least one book. For Diane Ahl, that trust has spanned generations. Her son grew up reading books selected by Mager. And in a few months, his own son will be brought home to a nursery stocked with a collection of children’s books handpicked by Mager. Booktenders was never just about sales, Mager said. Her mission has always been to cultivate a love of reading. The frequent visits by authors and illustrators grew out of that, her desire to make the process of writing and reading more tangible to children. Ellen Mager started Booktenders Secret Garden in 1983 while working as a youth hearing therapist. The future of the store is uncertain, she said, amid changing shopping habits and attitudes. Her tiny store became a mainstay on the children’s bookstore circuit. All the major authors know Mager, some even request her by name, such as David Shannon, who years ago rerouted one of his tours after a fill-in literary agent excluded Booktenders. Mager also coordinates author visits with local schools, including Doyle Elementary, where Caroline Copland formerly ran the library. But even with that expertise, Mager was a victim of the times. The last eight years have shown a marked reduction in foot traffic as big-box stores and online retailers undercut her prices. She also slowly saw a shift in attitudes: A neighborhood group asked for her input for books to use in a children’s book club but wouldn’t commit to purchasing the books from her. Last year, a pipe burst and destroyed 7,000 books, including her copy of Harry Potter and the Sorcerer’s Stone, signed by Rowling 20 years ago. That was the beginning of the end.